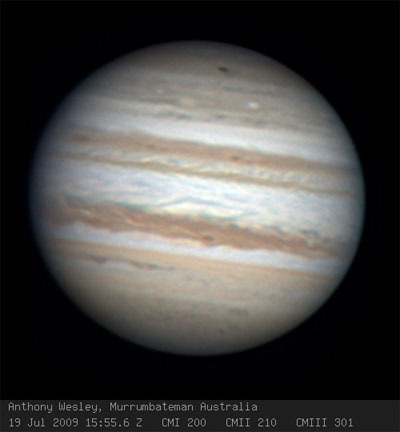 It was big news yesterday — an amateur astronomer in Australia, Anthony Wesley, snapped a picture of the aftermath of a major collision with Jupiter. I asked our amateur astronomy guru Paul Kinzer about this. Kinzer teaches folks about how to do effective backyard astronomy, and his Stargazing Basics covers, well, the basics. Good point. Remember, whatever caused that earth-sized impact spot on Jupiter was hundreds of meters across. But it’s good to know that we’ve got a gas giant holding up the gravitational rear. “Thank the heavens — literally! — that Jupiter is there, because, without it, I don’t think we would be. Sorry you missed the opportunity, Paul, and thanks for filling us in on our solar system’s vacuum cleaners. But it’s good to know, nonetheless, that even a modest scope can catch some very amazing stuff out there, even before NASA had the chance. Keep it up, amateur astronomers!